Charts that compare goat milk to cow milk or other types of milk are readily available on the Internet, in books, or wherever one might search when looking for that information. Maybe they all originate from the same place, or maybe it is just a proven fact that goat milk is really better than cow milk in comparison, but unless one hears a true-life story of the benefits of goat milk, there are still some doubts that linger. I do not know why it is so hard for the general public to believe in the goodness of goat milk but I do know that I and my family have experienced, first hand, the benefits of drinking goat milk on a regular basis. 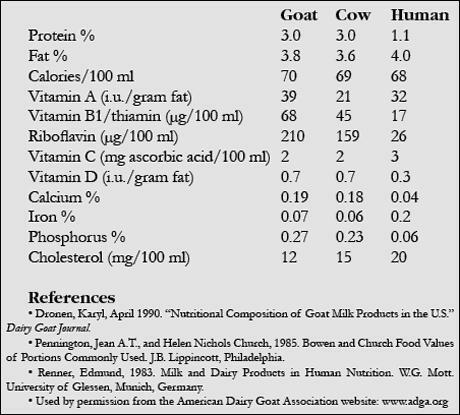 Goat milk is one of healthiest foods/drinks out on the market today. With its creamy texture, high mineral and vitamin content, goat milk replaces many of the supplements which people consume daily. Goat milk is better for most people than cow milk simply because it is composed of smaller fat globules which makes it easier to digest. This speed of digestion releases more good bacteria and enzymes in the consumer’s body, better enabling them to absorb and utilize the nutrients without discomfort, stomach ache, or a variety of other typical milk allergy symptoms. There are those who avoid goat milk because they do not appreciate the differences between cow and goat milk, and in some cases I agree. Goat milk is definitely a little thicker, richer, and creamier than the average homogenized cow milk available at the grocery store. For someone who is used to drinking 2% or skim cow milk, there is going to be a big change in taste when compared with whole goat milk. Being a goat farmer, I definitely prefer a glass of goat milk over cow milk any day. No disrespect, but after drinking the rich, sweet goat milk on our farm, I find that drinking cow milk purchased from a store is like having a glass of sour water. Now, a true comparison of rich flavorful, perhaps Jersey cow whole milk and rich, sweet goat milk, might reveal little taste difference at all. But most people forget the differences or origin and content when comparing cow and goat milk flavor. Scientific studies and taste tests are fun, but learning about the true benefits of drinking goat milk can only come from those who have experienced such and in my family, it is my mother who can best relate. My mother, Melody Reynolds, was diagnosed with Crohn’s Disease when she was 18 years old. Doctors immediately pulled dairy out of her diet as well as fiber, and put her on heavy medication. She lost massive amounts of bone density and was told she could never gain it back. Faithfully obeying doctors orders for several years, the frustration of making no progress encouraged my mom to seek non-medical advice. Her search for a way to save her life led her to goat milk. Ignoring the doctors’ requests, my mom drank raw goat milk. She said that her body felt as though it was craving milk and that she knew it was the right thing to do. Months and years later, through a series of bone scans, doctors were astonished to find that she gained back 80% of her bone density and regained functional, even good, physical health. The damage that was done to her large and small intestines went from a necrotic to a healthy state of function. She said that she is convinced that goat milk and prayer were the main factors that helped her heal. Doctors also told my mom that she would never be able to have children, and well, as her daughter, I can well attest to the error of that prediction too. Maybe I am here due to the wonderful benefits of drinking goat milk. My mom said that because of her will power not to give in to the disease, as well as the gallons of goat milk she drank, she made an unprecidented recovery from a destructive disease. She is still required to go to the doctor for regular testing and monitoring, and these professionals shake their heads in amazement when she tells them her recovery was based on drinking goat milk. There are many production factors and human errors in management that can affect the flavor of goat milk. We owe it to our goats and to our fellow human beings to make it a priority to produce the best tasting, cleanest, quickest cooled goat milk possible and make this available to the public on a regular basis so more people, like my mother, can enjoy a healthy life because of it. 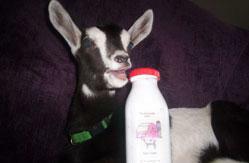 Everyone deserves a chance to experience great tasting goat milk!